As promised, here is my baked chicken tenders recipe. They’re the best! We all know kids love chicken fingers but I try to minimize and even eliminate fried foods from my toddler’s diet. With that being said he is extremely picky and I’ve struggled with feeding him meat. I make sure he gets a sufficient amount of protein from beans and dairy and get lean meat in when I can. 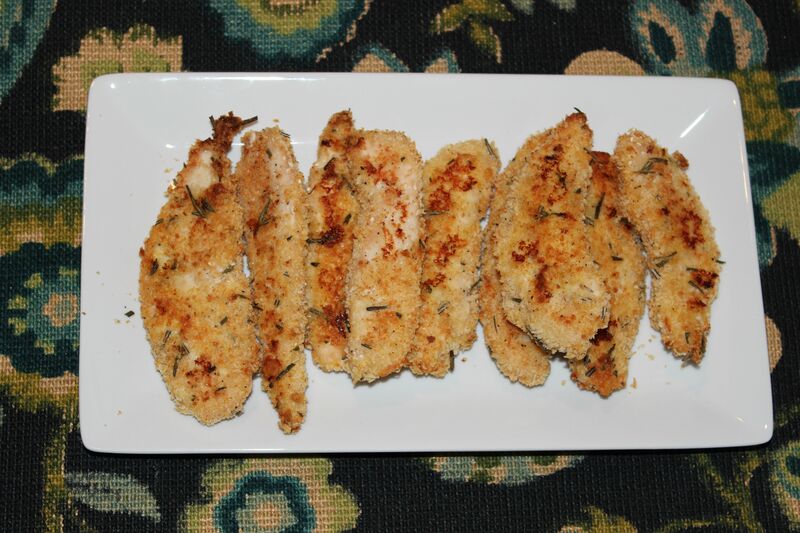 I finally made baked chicken tenders that he will actually eat and its really tasty for adults to eat too with a parmesan cheese and fresh herb light panko breaking. The best part is they are crispy on the outside and juicy on the inside without getting the frying pan out…and soooo quick and easy to make. Have three bowls set up. One with the flour, one with the beaten eggs and one with the panko, parmesan, rosemary, salt and pepper. Dip the chicken tenderloins first in the flour, then egg mixture, then breadcrumb mixture. Place the chicken on a baking sheet (does not have to be greased) and bake for 25-30 minutes (based on their size). For my side dish to go with the baked chicken tenders, I sauteed brussel sprouts in a little bit of extra virgin olive oil and chopped garlic and threw in a few cranberries to sweeten it up a bit. We also had a fresh tomato and mozzarella salad with balsamic vinegar. Quick, healthy and a really good dinner that my whole family enjoyed. For a time saver I sometimes bread the chicken ahead of time when my toddler is napping this way all I have to do is throw them in the oven. I hope your family enjoys this baked chicken tenders recipe as much as we did!